The other day I asked you which Jo Nesbo book I should read for the Norway leg of the Scandinavian Reading Challenge and 81% of you said I should give The Redbreast another go despite having abandoned it once before. Even though the challenge’s host, Amy, promised she wouldn’t send the book challenge police around to my place if I failed to read a book set in Norway I shall make this one of those rare occasions when I do what I am told and will tackle The Redbreast some time soon. In addition to The Redbreast I am also planning to read Snow Angels by James Thompson which is set in Finland. This will be a particularly good challenge for me to complete because all the books were either on my TBR shelves already or obtainable from the library. Of course Scandinavian blogger and writer Dorte from the excellent DJs krimiblog tells us that Iceland and Finland aren’t officially Scandinavian (though they are Nordic countries) but they were on the map that Amy used as the image for the challenge so I am going to count them for the challenge with sincere apologies to any offended Scandinavians. This entry was posted in Jo Nesbø, Scandinavian Reading Challenge 2010. Bookmark the permalink. Bernadette – I’m honestly glad you’ve decided to give The Readbreast another go. I apologise in advance if you don’t like it, but I really think you’ll be glad you did read it. Good comment. I’m going to try to read that, too, as well as “The Mind’s Eye,” and “The Darkest Room.” Also, although I’ve read three by Sjowall/Wahloo, I plan to read “Roseanna,” the first one. Have you read any of theirs? So I’ve read five so far for the challenge, but am going to try for four more, just because I want to read these books and like Scandinavian writers. But it is a challenge because so many books are appearing on lists that unless one reads 24/7 it’s impossible to keep up. 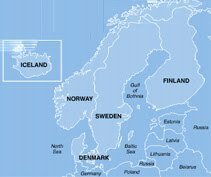 I included Iceland, too, and I thought the book I read very much fit in the Scandinavian crime fiction tradition, so I’m counting it toward my challenge, too. Kathy, I also read The Mind’s Eye and Roseanna, and I just started the Darkest Room, plus I have The Redbreast on my nightstand — I have so many Scandinavians that I put some toward the suspense/thriller challenge instead! May I suggest that you read James Thompson’s SNOW ANGELS last. It’s so dark and startling and evil! I almost had to revert to cozies after reading it! My first Nordic reads were the Inspector no-first-name Van Veteeren series by Hakan Nesser. At least the four translated ones. I understand there’s a new one and can’t understand why all his books haven’t been translated.